Keeping the Pounds Off! : FLASH NEWS!! Child Turns Down Candy! FLASH NEWS!! Child Turns Down Candy! On Sunday I took my eleven year-old nephew for his first trip to Hogsmeade in the World of Harry Potter at Universal's Islands of Adventure. I was delighted to have the opportunity to take him to Honeydukes: the store for all things sweet in the wizarding world. Sugar pusher that I occasionally am, I told him he could have anything he wanted. All he had to do was choose. He didn't pick a thing. 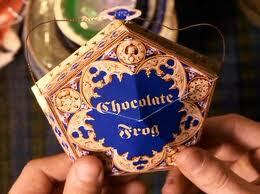 Not a chocolate frog, not a sugar quill. He didn't want Bertie Botts, caramel spider webs or chocolate wands. No cauldron cakes - nothing. Now I've seen him eat ice cream, brownies. cookies and chocolates so I know he likes the stuff, but in that shop of fantasy candy and all-too-real calories, he didn't want anything. Do you think perhaps he was under some sort of spell that took away his sweet tooth? I have never known a child to not want to try at least one sweet in a candy shop. He is in all respects a normal boy with lovely manners, good intelligence, a normal sized body and fine teeth. He had is mother's permission to have anything he wanted. Nothing was hurting. He felt good all day. He just did not want any candy. Maybe that is normal in people with your DNA (and if it is, shut up and go away), but in mine - no. I wonder if we can make a serum from his blood and come up with a vaccine to dull the sugar addiction in others? I am willing to be the guinea pig and take the vaccine first! I believe, sometimes, that he WANTS to eat junk because I talk of 'not having it in the house' as I don't always trust myself around certain things. However, it makes me breathe a sigh of relief to see him eat a few pieces here and there of a small container of his own special chocolates (for example) and not even touch them for days and sometimes weeks at a time!! This is the youngest. Her Godmother took her to the MALL and asked her to pick out anything she wanted, she wanted nothing. You could take middle child to the checkout aisle at a gas station and she would find four great things, they would not be junk food, they would be something that actually ARE great finds and she would have something great to do with all four.